Structural motion caused by external forces, gear chatter, imbalance, loose mounting, and other factors is easily analyzed and animated. By creating Operating Deflection Shapes (ODS), the STAR6 System™ enables you to analyze a structure using frequency domain measurements. In most cases, the ODS analysis is performed on a machine in its normal operating condition. You select the frequencies of interest, optionally animating the results to further understand structural dynamics problems. The STAR6 System™ generates scaled operating deflection shapes by using autopower and cross spectra in addition to transmissibility measurements- all with the same instrumentation setup. The result: You get accurate deflection shapes that are scaled to acceleration, velocity, displacement, or g's. These deflection shapes enable you to compare the amplitude of motion for different shapes-a capability not possible with transmissibility measurements alone. The STAR6 System™ uses special algorithms to track either peaks or frequencies. You can input a specific frequency at which you want to see the structure's shape. Or, by placing a band around a peak, you can track the peak frequency in the band. 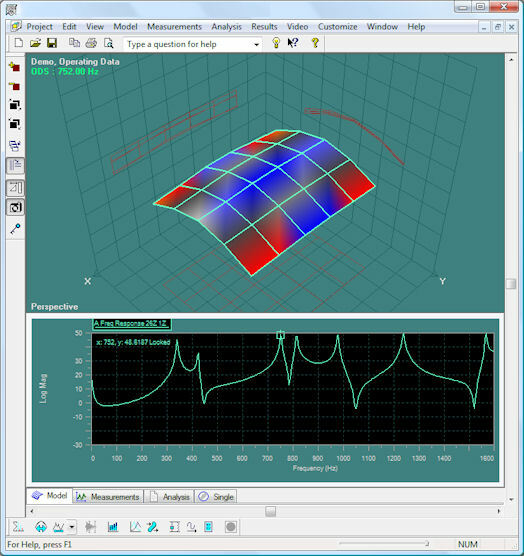 Most machines change speed slightly during operation; without the peak tracking technique, it is nearly impossible to obtain accurate operating deflection shapes for machines that drift in speed by as little as one frequency resolution step.